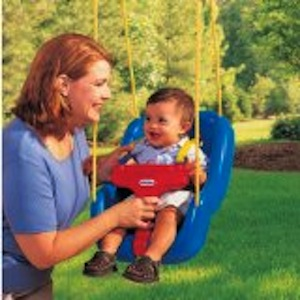 The 2-in-1 Snug 'n Secure™ Swing is easy to use and just right for babies and growing kids who love to swing! Features a T-bar that rotates down for easy loading and unloading. Adjustable stay-put shoulder straps hold baby securely in place. If using with a child who doesn't require the T-bar or straps, they move to the bottom of the swing and store conveniently out of the way. Ages 9 to 48 months, weight limit up to 50 lbs.